Well, we are on the brink of Spring Cleaning here. My garage, my yard… my HOUSE is a total disaster. :-p We have a lot of work on our hands. Temperatures finally slogged up to 45 degrees here in Upstate New York– woooooo! Break out the shorts and sandals! That’s a heat wave to us! (Weather is SO relative, isn’t it?). Me, I’m still wearing my winter boots. Canyou believe it? I haven’t had any time to go rummaging through our boxes in the garage, in search of my sneakers. I have a sneaking suspicion that they are squashed at the bottom of the stack, under the banana boxes of clothing. (We use old banana boxes for clothing storage- does anyone else?). I only wear sneakers for that brief duration of the muddy season– until May 1st that is. After that, I am barefoot or wear sandals. I LOOOOVE sandals, but I am so fussy about them. For one, they MUST be leather, genuine leather. I am willing to pay through the nose for the leather. I can’t stand my feet wrapped up in plastic or “simulated” leather. Ick. And I like the sandals wide and low-heeled. I gave up high heels after age 18, ykwim? 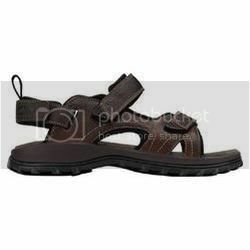 I scoured the stores last year, looking for replacement sandals for my Clarks Hudson brand leather sandals (yes, I wear men’s sandals. They are much more practical and comfortable!). My old ones were completely shot– falling apart at the seams, literally. But I found nothing. 🙁 I was getting them at a local retailer but I guess that place doesn’t stock them anymore. I found them at Buy.com! Aren’t they beautiful?! You can see why I love them so. And if you haven’t checked out Buy.com yet, you really must. I am finding that they have some really cool stuff, not just electronics. They have a Weekly Sale page onkline that showcases deep discounts on stuff,;and their regular stuff has great prices, too. And a lot of stuff has free shipping. Buy.com has top-notch customer service, too. I recommend them! By the way, they also have all the Buy.com video ads on their website, including the Howie Mandell ads. LOL! I love the place– if you ‘re looking for good deals on anything, check them out first. ← Are You Afraid of Death?